No tools required, and approximate 30 mph wind resistance. The Ultimate Portable Privacy, Safety & Security Barrier. Quick Deployment, Durable & Wind Resistant, Flexible & Customizable. The SRN 1000 Premier Barrier System by Stop Rubbernecking contains three steel tripods and four heavy-duty fabric screens. The all-weather screens release and reattach in most winds and once assembled, the system is self-maintained. Assembly can be completed in less than five minutes by one person. It comes with a special rolling travel bag for storage in the trunk of a car. Additional features include added weights for more stability. 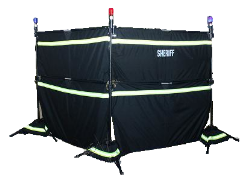 It can be used to conceal a car, enclose an entire crime scene to avoid contamination's, or minimize unwanted photos. Comes with Mobile Travel Bag.